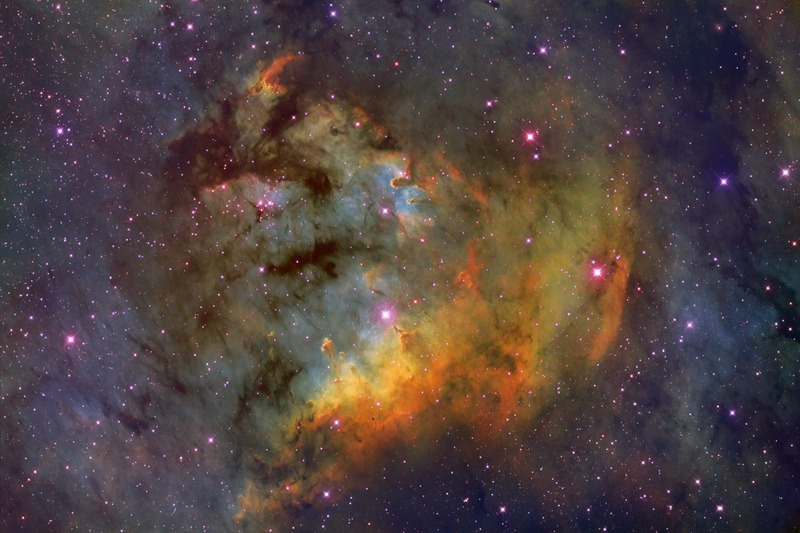 Explanation: Cosmic pillars of cold molecular gas and clouds of dark dust lie within Sharpless 171, a star-forming region some 3,000 light-years away in the royal constellation Cepheus. This tantalizing false-color skyscape spans about 20 light-years across the nebula's bright central region. It also highlights the pervasive glow of emission from atomic gas using narrowband filters and a color palette made popular in Hubble Space Telescope images. Powering the nebular glow are the young, hot stars of a newly formed cluster, Berkeley 59. Of course, this star-forming region is entry number 171 in the famous 1959 catalog of emission nebulae compiled by astronomer Stewart Sharpless.